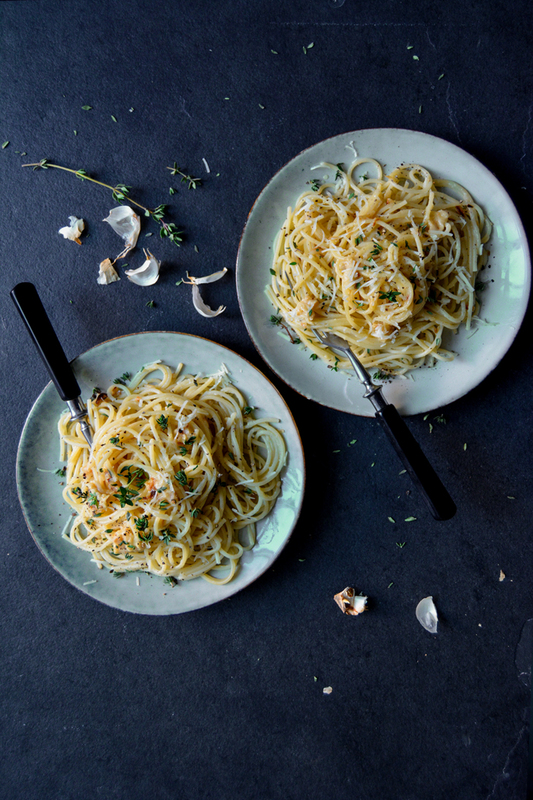 The amount of garlic in this velvety butter sounds intimidating but if you let go of the idea of harsh, raw garlic and think of smooth, oven-roasted cloves instead, it makes a lot of sense. For the two of us, I used 22 (!) large cloves, cooked in their skins in a hot oven. This kind of roasting turns them into a sweet, almost caramelized purée, so soft that you can mash it with a fork. I only mixed them with a bit of butter and salt and my pasta dish was almost done. 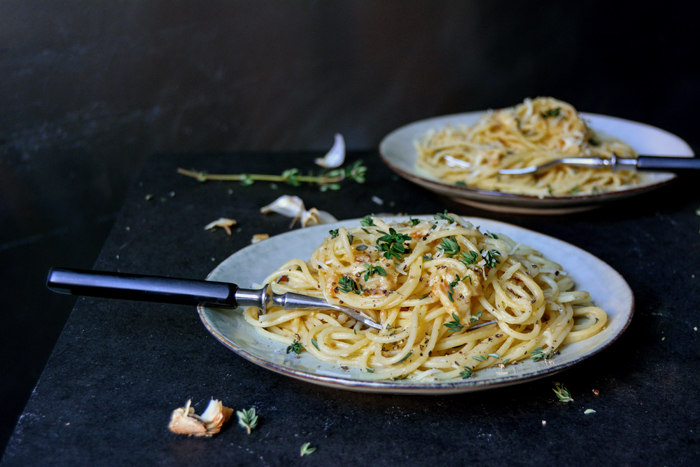 Young Pecorino melted on top of the spaghetti – parmesan would have been too strong and salty – and a few fresh thyme leaves and crushed peppercorns to balance out the sweetness. It’s a very simple dish but there’s something very sensual and satisfying about it at the same time. 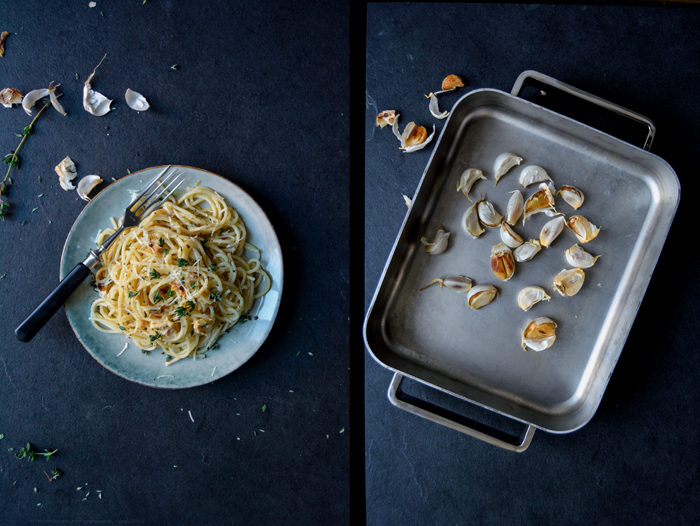 If I weren’t so much into tradition, I would consider exchanging my annual Christmas duck with this easy plate of pasta. A bottle of extravagant Bordeaux – bought without looking at the price, seeing that the dish itself wouldn’t cost much – and my relaxed Christmas Eve would be sorted. However, I can’t live without my slow roasted bird on the 24th December – which is Christmas in Germany – it was just a thought. Preheat the oven to 220°C / 425°F (preferably conventional setting). Spread the garlic in a large baking dish and roast in the oven for about 25 minutes or until soft. Turn the cloves occasionally and mind that they don’t burn. Let them cool for a few minutes, peel them out of their skins and transfer them to a blender or food processor. Cook the pasta in a large pot in plenty of salted water until al dente. Add the butter and a little salt to the garlic in the blender and purée until smooth. Season with salt to taste. 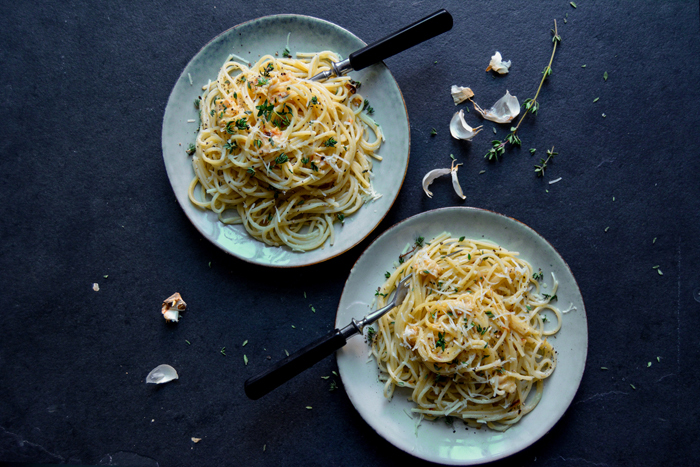 Mix the warm spaghetti with the garlic butter and divide between plates. 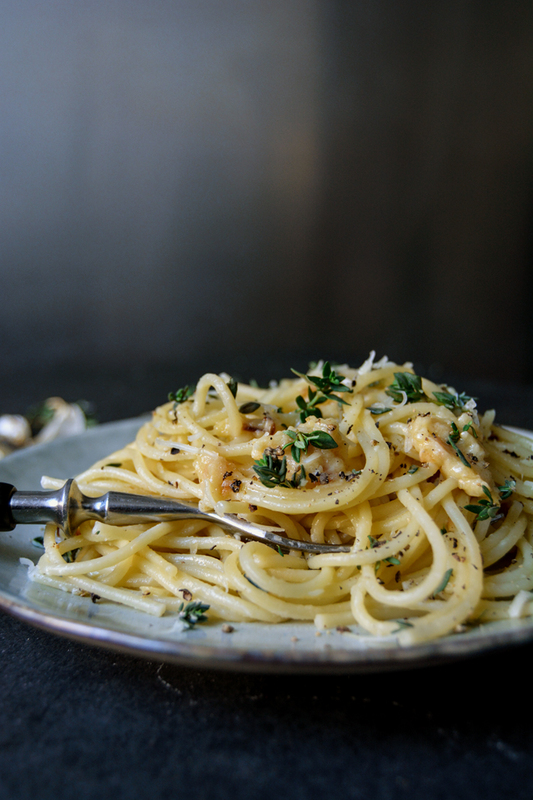 Sprinkle with pecorino, thyme, and pepper. Season with salt to taste and enjoy! young pecorino vs aged pecorino or parmesan, check. thyme vs parsley, check. as always, your highly thoughtful and skilled tweaks when going about working up a new recipe is what makes me love it here. 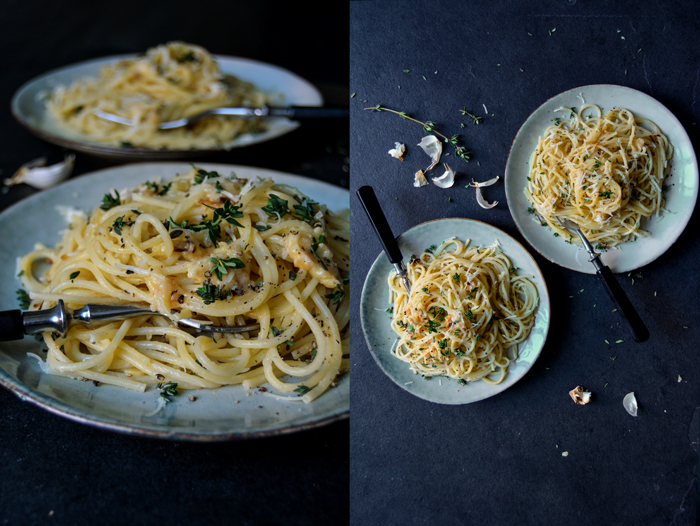 i can’t resist waiting to work this share into my world; i am going to make this tonight. the most beautiful christmas wishes and new year happy vibes sent to you and your’s, meike!!! love you!!! Merry Christmas Graze and a happy new year full of more deliciousness!! 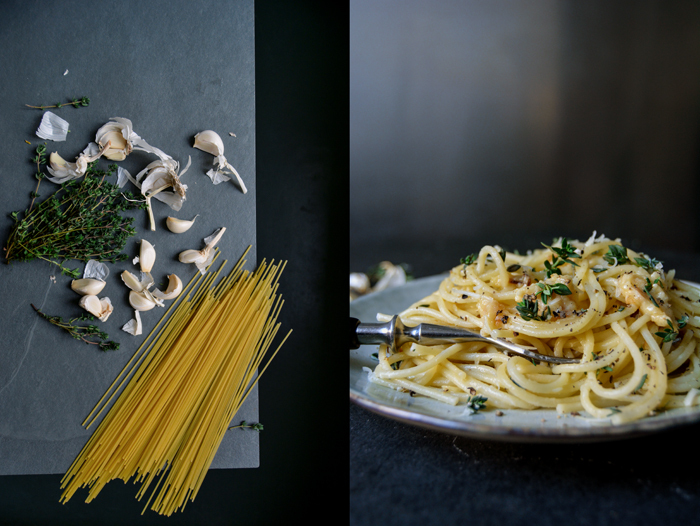 Meike, this is my kind of heaven…I love simple pasta dishes. We are having chicken breasts tonight and I was debating on what to do for a starch side dish…this settles it Thanks for the timely post.